Pakistan’s most popular politician finds provincial government altogether harder than national campaigning. Seventeen years into his political career, Imran Khan, chairman of the Pakistan Tehreek-­e-­Insaf (PTI), galvanized the nation’s dispassionate youth on a platform of fighting corruption. In this country of 180 million, it is a cause stamped with his image. Prior to the elections in the spring of this year, which marked the first ever democratic transfer of power for Pakistan, Khan’s message of “Inqilaab” (Revolution) achieved common currency, as he held rallies that brought hundreds of thousands into the streets of Karachi, Peshawar and Lahore. Khan’s image functions as a Rorschach test: each person sees the same image, but interprets it differently. Some see his actions as signaling the second coming of Zia-ul-Haq, the Islamist military dictator who once offered Khan a cabinet post in his regime, while others project onto him the image of Zulfikar Ali Bhutto, the populist and deeply charismatic statesman whose words still strongly resonate today. Khan’s appeal to the Pakistani psyche is linked to an unusual ability to court both sides of the divide, without still appearing to speak plainly. Pakistan Tehreek-­e-Insaf rode into the national election last spring on a sweeping wave, or tsunami, as Khan liked to call it, of popular sentiment. Part of this approval had to do with Khan’s status as a national hero for captaining the national cricket team that won the World Cup in 1992, defeating Pakistan’s former colonial master – England – in the process. Khan’s philanthropic fight against cancer waged through a franchise of hospitals he built across Pakistan to provide free treatment to the poor only endeared him all the more to the masses. But if these two elements formed his executive experience, then the pillar of his message was constructed in his opposition to the war against extremism the West was waging inside Pakistan. With overwhelming disillusionment with the United States – three in four Pakistanis see the United States as an “enemy,” according to a Pew Research Center poll ­­– this was a message that resonated. out in favor of PTI. Now that PTI has crossed its half­-year mark as leading administrators in the province, it is worth asking whether Khan’s promises have led to any sort of real change. The recent sacking of three key ministers from the coalition Qaumi Watan Party (QWP) over poor performance and alleged corruption suggest that there are fissures developing within the “tsunami” that Khan’s party rode into office. A leader of the Jamaat-e-Islami (JI) party that works closely with the PTI revealed to the Express Tribune that the decision to end the alliance with QWP was taken unilaterally by Khan, without proper consultation with the other party leaders that form the coalition. That these acronyms are failing to talk to one another, especially on matters of governance, reflects a broader failure in management in an area of Pakistan that is crucial to the broader security of the country. In matters of security, PTI – and by and large the central government – has failed to express an anchoring vision for stemming the growing tide of violence. Despite intelligence on an impending jail break, authorities in August were caught off guard in the town of Dera Ismail Khan, where Taliban-affiliated militants helped free close to 250 prisoners. In a three-hour gun battle, local police authorities were unable to subvert an armed assault, revealing to the world the embarrassing state of security in KPK. During the Eid al-Adha holidays recently, members of the Taliban assassinated Israr Gandapur, the minister of Law and a member of Imran Khan’s party, in the most high-profile assassination since the election. While a targeted operation has been launched in Peshawar, resulting in weekly arrests of dozens of suspects, the situation of KPK remains as unstable as it was during the last administration. Without proper structural changes on policies to combat and prosecute terrorists, security concerns will continue to metastasize. A central message of Imran Khan’s campaign was that he would bring peace to the area by reconciling disputes with members of the Taliban through a negotiated settlement. Through a painstaking public relations campaign waged inside Pakistan, Khan managed to single-handedly thread the needle that restored the image of the Pakistani Taliban as a group that is united in its commitment to negotiating with the government. Yet after several attempts at convincing the Taliban to bury the hatchet while at the negotiating table, the daily spate of violence across Pakistan at its hands continues unabated, chipping away at the appeal of the peace process that Khan so passionately helped construct. In his most recent efforts, Khan is seeking to hold NATO supply routes hostage after Hakimullah Mehsud’s death in a drone strike, hoping that this political cudgel will coerce the United States to end its drone program. To be fair, with every change in direction, some positives follow. After forming government, PTI sought to increase health care funding to the region by 40 percent, with the hope of upgrading defunct medical facilities, opening new hospitals, and bringing in newer technology to help treat the infirm with proper care. In addition, the introduction of Mobile Courts to the region by the provincial government has helped solve many small legal cases that had been pending for years. In an area where disputes are often decided by men without proper legal training through tribal Jirgas, this is a positive development that should bring ease to many families. 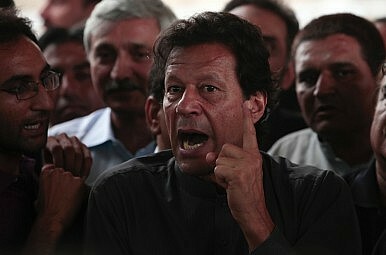 Imran Khan helped open the iron gates of hereditary politics last spring, bringing a fresher look to Pakistan politics. But Khyber Pakhtunkhwa is now approaching 200 days of PTI­-led rule, and little seems to have changed. The region today resembles the Bermuda Triangle, where any matter other than a peace initiative with the Taliban is likely to vanish. Reading the tea-­leaves in KPK is hard, but without something more than this tunnel vision, the province is doomed to continue to face the brunt of insurgent violence, lagging growth and an increasingly palpable sense of insecurity. Can the country stop the killing of its students? The Killing of the SikhsPakistan’s Dark History of Student ExtremistsWho Can Be Pakistani?Women in Imran Khan's 'New Pakistan'Is China Influencing Pakistan’s Elections?